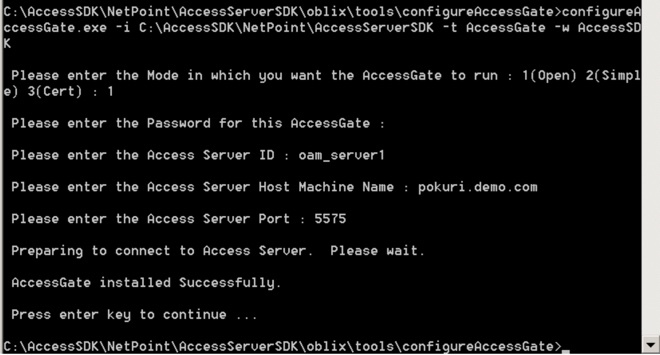 Install & configure ASDK 10g with OAM 11g R2 PS2 and test SSO using .NET ASDK API’s. Download and install apply patch “18110352” from Oracle Support which is the BP13-IP09 (latest version of the ASDK for Win64). Upgrading Access Server SDK from release 10.1.4.3.0 BP 10 to release 10.1.4.3.0.13-IP09 BP 13-IP09. 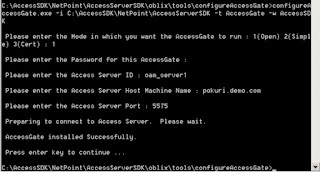 Unloading files to C:\NetPoint\AccessServerSDK/unload-Oracle-10143013-IP09BP13-IP09-2564. Copying files from 'C:\NetPoint\AccessServerSDK/unload-Oracle-10143013-IP09BP13-IP09-2564' to 'C:\Ne tPoint\AccessServerSDK'. Copying files from 'C:\NetPoint\AccessServerSDK/unload-Oracle-10143013-IP09BP13-IP09-2668' to 'C:\Ne tPoint\AccessServerSDK'. Successfully applied default Language message patch! Note: Ignore the highlighted warning in the patch update log. Make sure Visual C++ redistributable packs for 2005, 2008 64-bit is installed. Add obaccess_api_mgd.dll in Global Cache. Use below command. If every thing is good code should run and check if user is authenticated & authorized for protected URL. Hope this will be useful to some one out there.